Shebang security is a leading provider of bespoke Security products for the residential and commercial market. Our state of the art home Security systems and services include, audible and monitored Intruder alarms, monitored CCTV, Fire detection, Smoke Alarms, Access Control, Door Entry systems and Perimeter detection. Shebang security have over 25 years’ experience within the security sector. We're very focused on understanding what our customers need - and delivering it. Our company has grown steadily over the years, but we always make sure that our quality and service standards are maintained in everything we do. We are an ‘Insurance Approved’ company that can be found on the ‘police authority’ and ‘local council’ lists of approved installers. 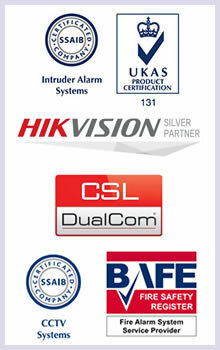 We are accredited by the Security System and Alarm Inspection Board (SSAIB) and are inspected accordingly. All systems are installed and maintained to the relevant British Standards and we offer a 24- hour emergency service. We use a range of providers and technology allowing us to create exactly what our customers need at a reasonable price. Our product knowledge portfolio is extensive and continually evolving to provide our clients with the most knowledgeable engineers in the areas, utilising the latest developments and state-of-the-art products to provide our clients with the full range of electronic security available.